Raising money online is one of the most effective ways to make a profit with a school or club fundraiser. After all, online fundraising allows anyone, anywhere to contribute to your campaign. There are plenty of online fundraising ideas for schools and clubs to choose from, but why waste time sifting through hundreds of ideas? 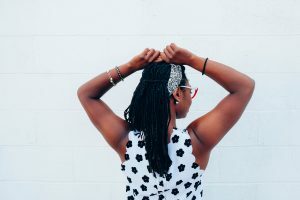 Any one of these ideas can help you engage your students and raise more from your donors, so let’s get started with the first. Peer-to-peer fundraising is a great idea for schools and clubs who want to make use of their students’ extended social media networks. In peer-to-peer fundraising, each student, class, or club creates a personal fundraising page. They can then customize their page with text, photos, and videos and share their pages over social media or email. Donors can give directly to the personal fundraising pages, and your school receives the funds! To motivate your students, you need to determine a personal fundraising goal for each of them. Every student who meets their goal should receive some kind of prize, such as a ticket for a school lock-in. Peer-to-peer fundraising is a great way for students to reach out to their friends and family members without having to sell them something that they may or may not want. Instead, donors give directly to support the student in question and help them achieve their goal (and receive the prize that you have waiting for them!). Plus, students have the opportunity to tell their personal stories and explain how donations can benefit them directly. These personal appeals can help your school or club fundraiser stand out to donors! Your school will likely need peer-to-peer fundraising software to pull this off. With peer-to-peer fundraising software, students, teachers, or parents can create personal fundraising pages so that they can collect online donations and tell their personal stories. Peer-to-peer software streamlines the donation process so that your school or club won’t have to individually process each payment or manually send receipts. Many students today are involved in social media, especially at the middle and high school level. However, peer-to-peer fundraising doesn’t have to take place online. Students can just as easily go door-to-door to collect funds (which is a good alternative for younger students, or those who don’t have access to the internet at home)! However, providing donation pages is a great way to brand your fundraiser to your school or club and showcase how much you need to raise on an interactive page. Plus, online giving is more convenient for donors, who can donate from the comfort of their homes! 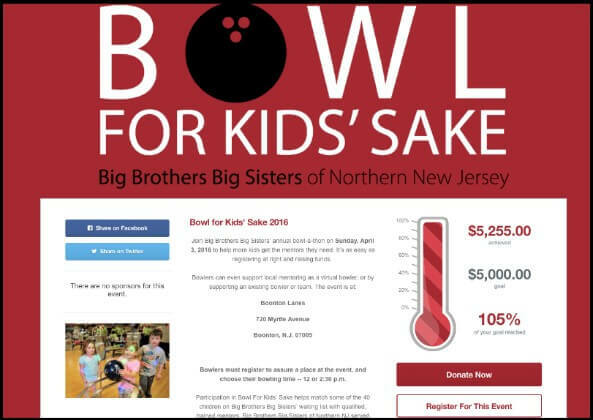 Check out this example from the Bowl for Kids’ Sake fundraiser! Leaderboards are a great way to inspire your students and faculty with some friendly competition. 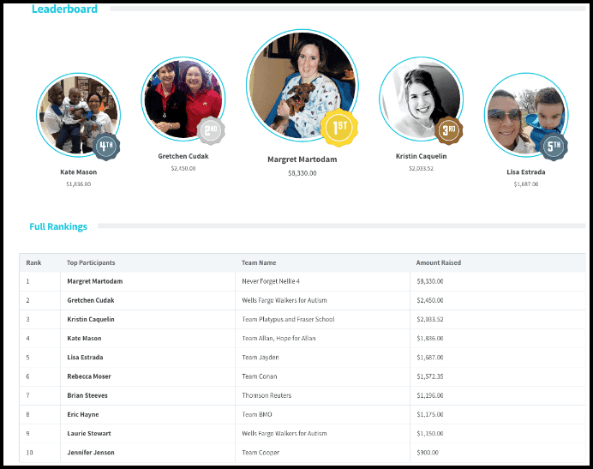 Leaderboards make use of peer-to-peer fundraising, but they add an interesting twist; instead of trying to achieve a personal fundraising goal, each participant tries to raise the most money possible to win a prize. Each teacher creates a peer-to-peer fundraising page and solicits donations from students. The teacher who raises the most money gets to have a class party for a day. School clubs create a peer-to-peer fundraising page and solicit donations from students and the community. The club that raises the most money receives extra funding. The key is to provide a reward for the fundraising team who raises the most money. Leaderboards work because they capitalize on the “fun” in fundraising! A little friendly competition can add a great deal of energy and zest to your fundraiser because it motivates your supporters. If you’re using comprehensive peer-to-peer software like Qgiv, then leaderboards are already included in the package. These leaderboards update in real-time so that everyone in your school always knows who’s on top (and how much they need to raise to claim the throne themselves). Otherwise, you can manually create a leaderboard on a whiteboard or chalkboard and assign a staff member to update the leaderboard everyday. Check out these leaderboards from the Fraser Walk for Autism! One of the best ways to simultaneously promote school spirit and raise funds for your school is by selling custom gear online. Almost every student, parent, teacher, and faculty member could use a t-shirt with your school’s name, colors, and mascot on the front! These shirts are perfect for school sporting events, spirit weeks, or just everyday life. No matter which you choose, customize your products so that they represent your school or club! Custom gear is generally affordable and can be marketed to everyone in your school. Plus, custom clothing is something that donors can actually use. Cookies will be eaten, flowers will die, and does anyone really need more candles? T-shirts, on the other hand, have staying power, which gives them value! At the same time, people are willing to buy new t-shirts every year if you vary the styles. To get started selling your custom gear, consider opening up an online storefront so you can process orders through the web. 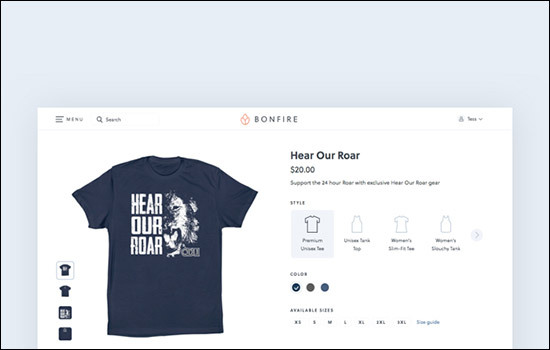 Your school can leverage t-shirt fundraising by joining a platform like Bonfire. With their t-shirt fundraising website, your school can design and sell beautiful apparel like t-shirts, tank tops, and sweatshirts. Once your school’s t-shirt fundraising campaign reaches enough orders to make a profit, Bonfire simply charges for manufacturing and shipping. 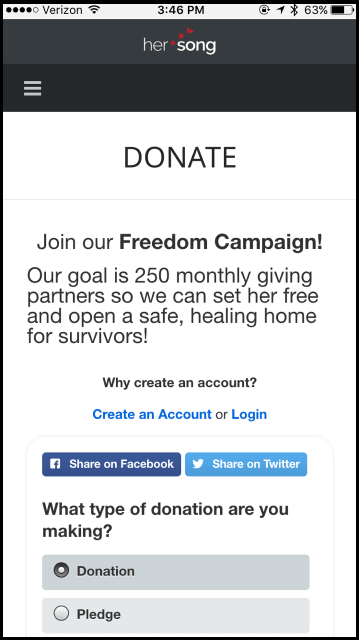 You can even enable donations through your sales page so that supporters can contribute even more to your cause. Check out this example of how a school leveraged Bonfire’s platform for t-shirt fundraising. Your clubs and teams shouldn’t have to depend on one or two fundraisers a year to stay afloat. One of the best fundraising ideas that can lead to long term success is creating custom donation pages for your school’s organizations. 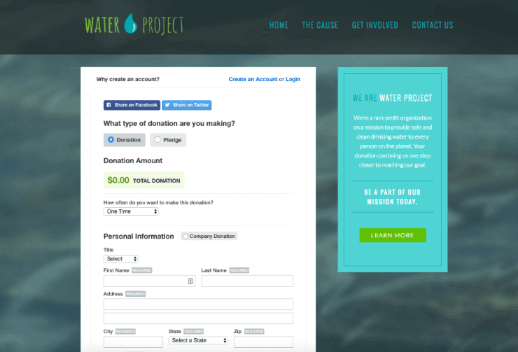 Custom donation pages not only make it easy to differentiate your various fundraising campaigns but also make it easy for donors to know exactly who is receiving their funds. After all, donors are going to be hesitant to give if they land on a generic donation page that isn’t branded with your school’s mascot and colors. When you choose online fundraising software for schools that can be fully customized, you’ll have more flexibility to create a page that is unique to your school and fundraising campaign. With custom donation forms, your school can fundraise all year ‘round! Custom donation forms are versatile; they suit practically any fundraiser that your school wants to hold! You can reach more donors with an online presence. When students can share your online donation page to family members in different states, your school will raise more. You can meet your donors’ giving preferences. Not all donors will carry cash with them. Online giving allows them pay with credit or debit cards from the comfort of their homes. It’s convenient. Donors can access online giving wherever they are. Donors are more likely to give when they can do so on their terms. Custom donation forms are an investment in your school or club’s success! Enlist the help of online fundraising software, which can help you build beautiful pages without advanced knowledge of HTML or CSS. Build your page internally, using a pre-existing IT department or other technical resources. Many schools opt for the first option, simply because online fundraising software is easier to use and designed for school or nonprofit use. All you’ll need to do is determine your donation tiers, your design, and the fields that you want donors to fill out. Check out this example from The Water Project! Teachers and administrators may complain about students using their cell phones in class, but mobile devices can actually be a huge benefit to your school. 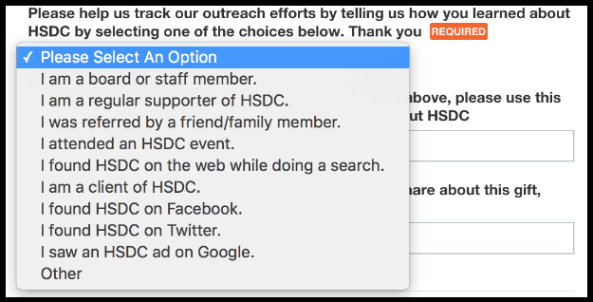 People don’t have to resize their screens or scroll left and right to fill out your donation forms. Each field is easy to click on and fill out. The page loads in 3 seconds or less. Your text and images line up vertically (i.e. images don’t stack or break up text in the middle). Your “Make a Donation” button is large and easy to press. Following these tips will ensure that your donation forms are donor-friendly! With effective donation forms, you can collect donations all year ‘round, building a steady stream of donations for your school or club. With mobile giving, your school or club can raise money from devices that students use all the time in their daily lives. When students and families can donate whenever the fancy strikes, your school or club will naturally receive more donations. Plus, mobile giving can be paired with all kinds of fundraising ideas! This fundraising method is so versatile, you can promote it alongside an event or combine it with the appeal strategy of your choice. The options are limitless! Mobile-responsive donation form software can help your nonprofit raise the funds that you need. To get started, change your lesson plans for a day. Have teachers instruct students to pull out their cell phones and test out your mobile donation forms for themselves. Students will get a kick out of having their phones in class, and you can rest assured that all of them will know how they can contribute to your school. Check out this example from Her Song! In a principal challenge, students vote with their dollars to determine a “punishment” for their principal. The punishments are all in good humor and fun. The principal gets a pie in the face from the top fundraiser. The principal wears a wacky costume for a week. The principal dyes their hair a bright, crazy color. There are tons of variations on the principal challenge. Anything that your principal is willing (and eager!) to do on behalf of your school is up for grabs! When students make an online donation, give them a list of options to choose from. Each option should be a different punishment. The punishment that raises the most money will be the one that your school will use. To inspire more donations, you fundraising team will need to come up with some great punishments. The more ridiculous the punishments are, the more students will compete to have their favorite idea become a reality! A principal challenge is great fun for everyone! Students can see a respected figure act a little silly for the benefit of their school. Plus, friendly competition can encourage students to donate more. When building your donation forms, simply include a dropdown menu so that students can choose which punishment they’d like to vote for. 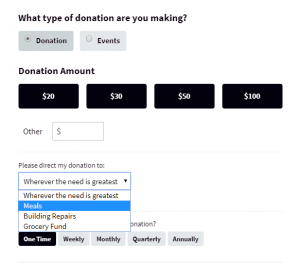 Many online donation forms make it easy to create options that people can select when they make a donation. Check out this example of a dropdown menu from Qgiv! A school dance is something that students look forward to. One of the best ways to incentivize donations for your school or club is to create a crowdfunding campaign with a school dance as the reward. Here’s how it works: your school will determine an overall fundraising goal that students must achieve to turn the dance into reality. Students, teachers, and families can all contribute as much or as little to the campaign as they’d like. Together, your school works toward a single goal! To make this fundraiser really actionable, divide your campaign goal by the number of students in your school. Then, you can advertise your crowdfunding campaign based upon how much each person would need to contribute (i.e., if every student gives only $10, we can host the dance!). Be sure to provide some wiggle room with individual goals to account for students who won’t (or can’t) donate. A school dance is something that most students will enjoy! Plus, crowdfunding is all about teamwork — when students work together to raise money for your school, they all have a stake in reaching your goal. A band party or concert. Crowdfunding is a versatile fundraising idea that can meet all sorts of needs. All you need is a crowdfunding platform to host your campaign and a big prize to motivate your students (i.e. the dance!). Be sure to choose a crowdfunding platform that works with nonprofits or schools, like Fundly. Check out these examples from Fundly! Another effective school fundraising idea is promoting matching gifts. Did you know that many companies, from small businesses to large corporations, will match their employees’ charitable gifts? For your next school fundraising campaign, your team should find ways to promote matching gifts to supporters. This way, your school can possibly double (or even triple) the success of your fundraisers simply by tapping into your community’s matching gifts potential. Promoting matching gifts is great because it helps stretch the impact of your supporter’s donations. Your school can get started boosting your matching gifts revenue by investing in matching gifts software. This includes matching gift databases that compile information on different companies’ matching gift programs, parameters, and other key information. Supporters can search the database to determine whether or not they’re matching gifts-eligible. If they are, all they need to do is follow the instructions to learn how to secure their gift match for your school. Check out Double the Donation’s matching gift tools! Gourmet or fair-trade coffee can help your school or club raise money from students’ families and neighbors. Fair-trade coffee has the added benefit of being an ethical fundraiser, so your school can set a positive example for students! Sell coffee beans online in a storefront so that students can easily share the fundraiser to their extended network of friends and family members. Coffee is something that all kinds of people appreciate. Many people drink coffee every day. While any of these foods will work, coffee beans are proven moneymakers that are sure to tempt your donors! To run your online coffee fundraiser, you’ll need to find a coffee fundraising company with an online platform. Alternatively, you can build an online storefront with online fundraising software and feature the coffee products that you’re selling (though you would have to do so manually). 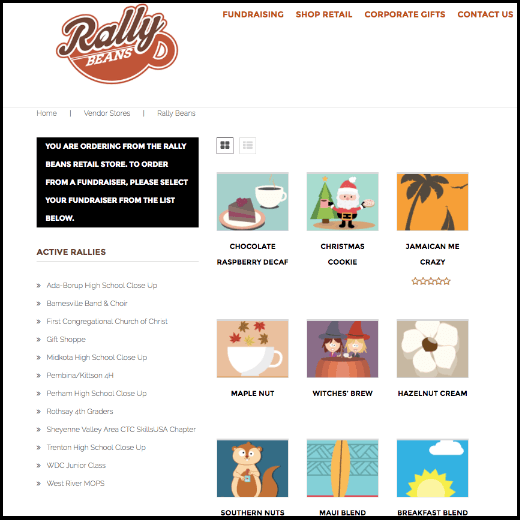 Rally Beans allows schools and nonprofit groups to sell different coffee products through their website. Raffles and auctions are a great school fundraising idea because they’re so much fun for participants. Auctions and raffles offer an element of excitement — donors compete for the chance to win awesome items! One of the biggest benefits of charity auctions and raffles is that they can be customized to suit your needs. Raffles work best for both students and parents. Since raffle tickets are low-cost, more people can afford to purchase them. 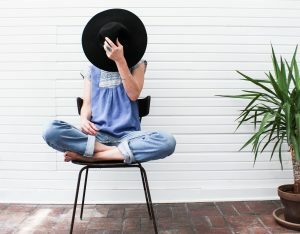 In contrast, auctions are generally better suited to an adult audience, though pricier items can help you raise more money. For the best of both worlds, combine an auction with a raffle so that students and families can all participate together! To host an effective auction, you may need the help of auction software. Auction software can help you plan out your auction by keeping track of your item data. Accept payments through mobile and online giving channels. Plus, you can use mobile bidding so that donors stay on top of their bids (after all, they can place bids from their personal cell phones without having to traipse around the venue). 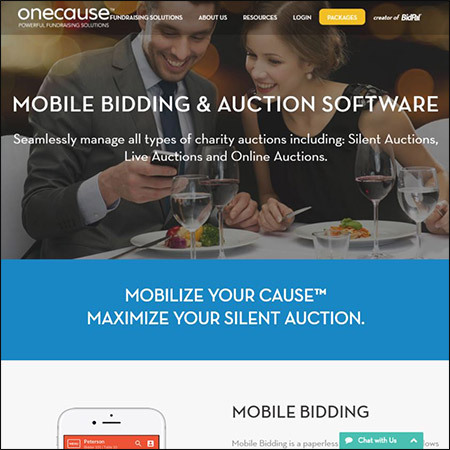 Check out OneCause’s charity auction software designed for all kinds of auctions and raffles! Now that you know the top school and club fundraising ideas for raising money online, it’s time to choose the one that’s right for you! To get started, request a demo from Qgiv to see how our fundraising solutions can elevate your school fundraiser and help you raise more money! If you’re looking for more ways you can raise money for your school or club, look at these awesome articles. Top Online Donation Tools. For a cost-effective way to raise money, schools and clubs can take their fundraising initiatives online. Additionally, schools will be able to reach more supporters through online and mobile tools. To find the right tool for your school, discover Qgiv’s full list of popular donation tools. Salsa’s 5 Questions to Ask Before Buying Event Fundraising Software. Want to get more out of your school’s fundraising events? Invest in event fundraising software! Check out Salsa’s top questions to ask before making your purchase. Text-to-Give Guide. Reach students, parents, and teachers on a familiar platform. Since your supporters use text messages to communicate on a regular basis, they’ll feel more comfortable giving to your school via text-to-give. Learn how you can get started with text giving with this comprehensive guide! Top Peer-to-Peer Platforms. Does peer-to-peer fundraising sound like a fantastic fundraising idea? Before you launch your campaign, find the right platform. 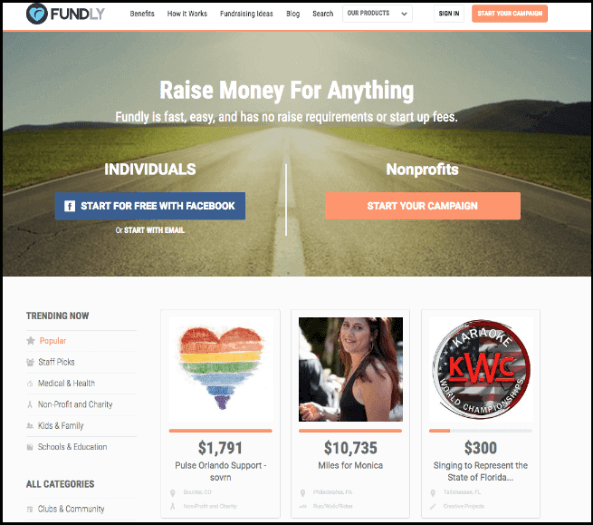 In this article, we’ll take you through 8 of the best websites for your fundraiser.